To follow-up with yesterday's post... As mentioned before, I am the first to cringe at announcing I am anything special but I will say I have to consider that worth, value, intelligence or any number of attributes is a relative measure. I know that I can honestly say that I am not smarter than a doctor... or am I? A measure of intelligence must be attached to a non-biased standard. (or as unbiased as possible). So, if a doctor was asked to de-frag a hard drive, he might schedule an operating room. I, on the other had would think that was not very smart. So, I say all that to say, objective intelligence must be measured by a standard. In my case, (and to relate back to the prior post) was involved in a competition during my Capstone class. This "game" was actually used to compete with other teams in your class but also with those that subscribe to this competition across the world. Well, let me say that I did not go to an ivy league business school but was competing with many business schools across the world. Yes, this was a global competition and am proud to say me and Shakarri beat everyone in my class. Overall Game-To-Date Score - Your Overall Score of 108.5 tied for the 21st best Overall Score performance of the week, worldwide! 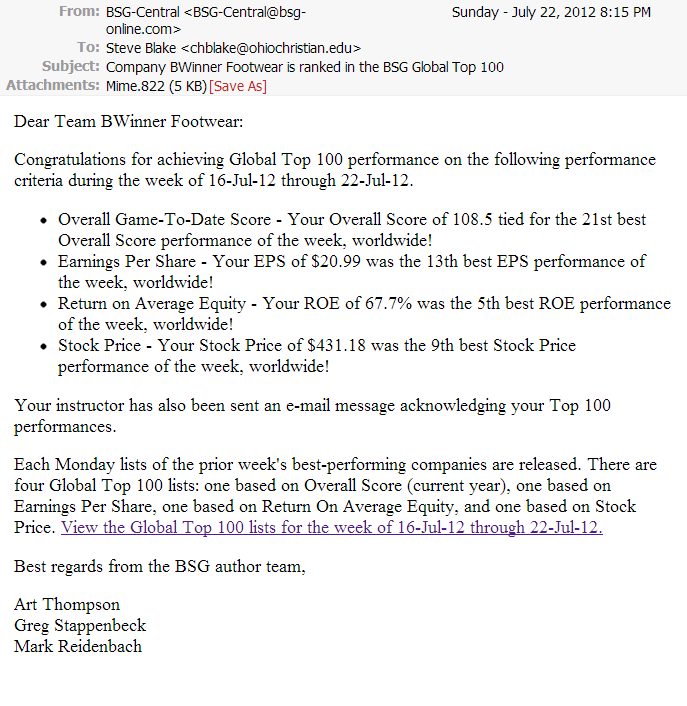 Earnings Per Share - Your EPS of $20.99 was the 13th best EPS performance of the week, worldwide! 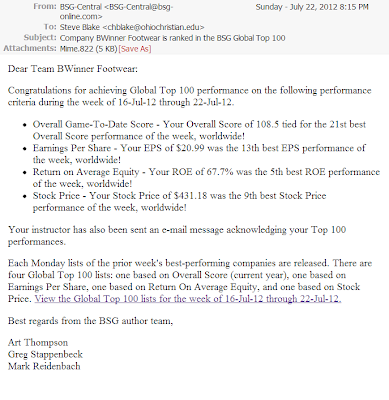 Return on Average Equity - Your ROE of 67.7% was the 5th best ROE performance of the week, worldwide! Stock Price - Your Stock Price of $431.18 was the 9th best Stock Price performance of the week, worldwide!